The literal translation of the word satellite (companion) does not come close to explaining how complex these technical devices are and what they do for our daily lives. Their tasks range from weather forecast to message transport and navigation information. 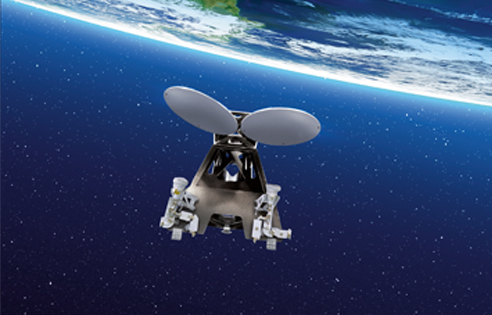 The Airbus Defence and Space division is one of the world‘s leading suppliers of satellite and space transport technology. Its Spanish subsidiary is part of the satellite business and the largest aerospace company in its home market. The portfolio ranges from satellite systems to components for the International Space Station ISS. A competence centre for composite materials is also located at the headquarters in Madrid – because innovative materials and production methods play an important role in the aerospace industry. The requirements for the devices are particularly high because of the tremendous temperature differences and external forces involved. To achieve the best results in component manufacturing, Airbus Defence and Space relies, among other things, on Additive Manufacturing technology by the German company EOS. The current generation of satellites includes specific brackets that serve as a link between the body of the satellite and the reflectors and feeder facilities mounted at its upper end. The engineers at Airbus Defence and Space faced two key challenges with regards to the construction of these retaining brackets: on the one hand, the brackets must fix the securely to the body. On the other hand, however, the task of the brackets is to mitigate the extreme temperature fluctuations in space. The brackets are very important as a layer of insulation:the temperature ranges from –180 to +150 °C, so the stress on the material is extremely high. Very few materials are able to meet these requirements. As so often in the aviation and aerospace industry, titanium turned out to be the appropriate choice. In addition to its well-known advantages with regards to weight and thermal conductivity, it offers an acceptable density.After all, every kilogram to be carried into space costs many thousand dollars; the exact amount depends on factors such as the carrier system and the orbit to be reached. However, six-figure sums and higher are not uncommon. The brackets manufactured in the conventional way and especially their connection with the carbon components of the satellite – a function subject to high thermal stress – did not meet the expectations of Airbus Defence and Space. In addition, subsequent installation on the satellite component was very time-consuming so costs needed to be reduced. The engineers therefore began looking for alternatives. Special attention was paid to the fact that the design of future components could be optimized accordingly. After the design was established, the well established process followed: the engineers loaded the 3D construction plans from the CAD software into the production machine – an EOSINT M 280 – and started the manufacturing process: a laser beam precisely melts and hardens the deposited metal powder layer by layer, so when the precisionmade workpiece is complete, no excess material remains except for re-useable raw material. satellite is now less than a month. ”These improvements significantly reduce thermally induced failure during the qualification test campaign. The cost of space activities is relatively high, so it is even more important to protect any hardware from possible failures,“ adds Castro Matías. ”The Additive Manufacturing method brought measurable benefits to critical aspects of the project, without requiring cuts to be made elsewhere. No compromises - this is something engineers like to hear, but don’t get to hear very often.“ In addition to the technical advantages, targeted cost reductions were achieved: savings in production alone amount to more than 20%. What is more, the engineers successfully put the part on a diet: the weight advantage is about 300 g, which means nearly one kilo per satellite. Incidentally, European Space Agency (ESA) supported this program. Its successful completion it allows further use of this efficient production technology in the aerospace field.